The unwieldy bell-shaped skirts of the 1840-60s gave way to a more streamlined look in the 1870s. Perhaps too many ladies met with mishap trying to navigate doorways, which explains the narrower skirt with the bustle in the rear. The gowns in the illustration above are made from cashmere, tulle, tartalan, silk, gauze, poult de soie (ribbed silk), and crape. Colors ranged from white, cream, and grey, to bolder hues such as prune and royal blue. I’m not convinced the Victorians entirely fit their repressed stigma; how else can you explain the riot of excess from head to toe? A frilly hat, elaborate hair, ornate jewelry, and a rich gown in frothy layers… not to mention the lacy parasol, reticule, slippers, and fan? This evening gown from 1873 screams indulgence. It would’ve cost the modern equivalent of about $700. Done in salmon-colored faille (light-woven ribbed silk), the chenille ball trimming is meant to imitate the look of pearls. Don’t miss the enormous gold collar, and with the pink and yellow roses in her hair, this fine lady must have been quite a sight! The tiny wasp-waists you see in the drawings are no exaggeration. The corsets featured in this 1869 fashion plate are designed to punish the entire torso into a dramatic hourglass shape. The practice of “tight-lacing” resulted in waists averaging 18-21 inches, and as small as 14-15 inches. It took years to mold the female body into these shapes; the “shoulder braces” in the bottom right corner are for a girl 8-10 years old, and the corset in the bottom left is for a child 1-2 years old. I’m simply mad about Victorian jewelry! Aren’t these marvelous? You see designs by Tiffany & Co, and Browne & Spaulding. Diamonds are a perennial favorite, but emeralds, sapphires, opals and pearls were en vogue in 1868. Note the ear hooks — evidence that piercing was common practice. The truly fashionable Victorian lady changed clothes several times a day: dressing gown, morning gown, day dress, walking suit, tea gown, and heaven forbid she need a watering-place suit or riding habit before dressing in her evening gown. What you see here is a “carriage dress,” cut in daytime fashion but with elaborate trimmings — all the better to impress her acquaintances as she goes out in her carriage for visits. The white muslin skirt trimmed with four flounces, violet-ribboned front trellis, puffed brown foulard overskirt… one can’t help but wonder how this gown is conducive to getting in and out of a carriage. I don’t know about you, but I would love a pair of these boots from 1882. Walking boots tended to be made with a wooden sole and heel, but a cloth upper and shaft, so stepping in a puddle truly meant disaster. The slippers were typically made of embroidered satin, inspired by Turkish styles. This fashion plate from Harper’s Bazar in 1871 shows how to create some wild hairdos. All you need are crimping pins, a tortoise-shell tiara, and four-foot-long hair. On the left: A Parisian bridal gown in ivory satin, Brussels lace, and trimmed in (live) orange blossoms. Note the tulle veil and kid gloves. On the right: French traveling dress in silver silk and dark velvet for the bride to wear as she goes away on her honeymoon. Believe it or not, this is a bathing suit, circa 1881. It might blow your mind to hear it’s made of flannel, unless you take into account that the water on English beaches is quite cold. It was said that these horridly revealing bathing suits worn by fast women caused respectable parents to cover the eyes of their children as they fled the scene. Oh, the scandal. 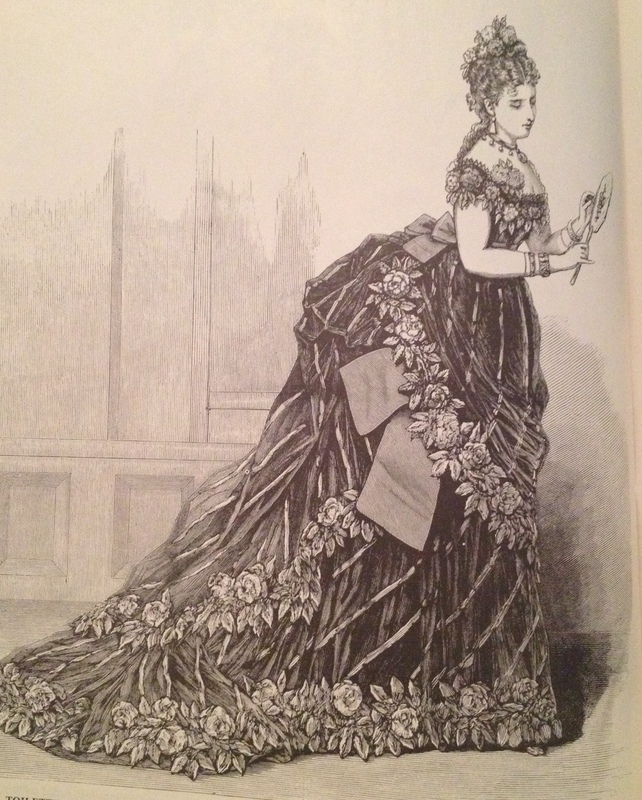 I really should get back to writing, but first I wanted to show you this incredible evening gown made by Worth, who introduced the “fan train” in 1873. Gold-striped Chambéry gauze in black falls diagonally across the front, pleats down the bustle, and fans out at the end of the train. Instead of fastening live roses (which tended to meet a grisly end at the rigors of socializing), Worth used appliqué embroidery in silk and chenille on tulle to create the rose trimming. With the heavy gold jewelry to accent the gold stripes, this intrepid lady must have turned heads. * Images of fashion plates used by permission: Victorian Fashions & Costumes from HARPER’S BAZAR: 1867-1998, edited by Stella blum, published by Dover Publications, Inc.
I’m a casual kind of gal. I cannot believe the swimsuit. Hee hee! They’d all roll over in their graves if they saw what women wore today. Heart attack, for sure, Lori! It’s hard to imagine such a high-maintenence lifestyle. You could be certain you’d feel very feminine, at the least. I’m a jeans-n-tshirt kind of girl myself most days, but come on – admit it – if you could go to a ball wearing one of these gowns, you would do it, right? At least once? I always laugh when I read the books and those ladies are changing clothes half a dozen times a day. I would not survive that! I’d hang out in my exercise clothes all day long if I weren’t afraid of bacteria! I’m glad you posted this, cause it is cool, and I have a feeling it’s probably the best part of the research! Thank you for reblogging, ki pha! I’m very flattered. By the looks of all the bustles, undergarments and frippery, I think all of it would go a long way in dampening a gentleman’s interest in ridding a female of her clothing! OMG it would take forever! Absolutely, Janice. All the classic “bodice ripper” stories are way off. Too many layers. However, drawers (underwear with legs) weren’t invented until the mid-1800s, so the innermost layer was a shift – basically a knee-length shirt. If by some mishap a lady literally fell head-over-heels, it would be the ultimate embarrassment. *sigh. I also have a soft spot for Victorian fashion. My wedding dress was very Victorian looking, with a cathedral length train that could be bustled up. Oooh, sounds lovely, Lisy. Pictures! We want pictures! My pleasure. And thanks for visiting, VJ.